This is the place for hands-on STEM+A (science, technology, engineering, math + arts) programs for youth and adults. If you can’t get enough of science in school or at home then come and explore the wealth of creative programs we offer for those that love to build and explore. Have access to the latest tools and technology that makes the sciences so exciting. Prepare to be challenged and also to have fun, all the while growing your knowledge base. Check out the variety of after school and evening STEM programs we offer for youth and adults through the links below. A workshop with real engineering experience. Our signature program has allowed members to design and then build whatever their imaginations can dream up. Click the link below for more information. Interested in engineering? This course is perfect for teens who are seeking more experience and knowledge in the field of engineering. 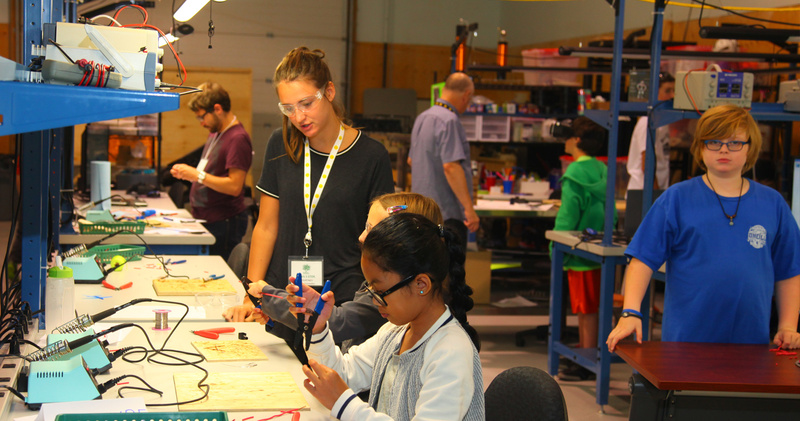 For the duration of the 10 class course, students will experience building several projects with electronics, microprocessors, 3D printers, mechanical systems, Computer Aided Manufacturing systems, coding and a whole lot more. This course includes more science and math as well as learning to apply this knowledge. The program will be held at North Point School located at 2445 – 23rd Avenue SW, Calgary and is open to the public. For older students that loves science, building with your hands and making new friends then these Workshop Wednesday programs are for you. You’ll rediscover your passion for discovery and engineering. Click the link below for more information.